These words of encouragement as well as a handy number 2 pencil were paid for by SCORE. Here’s the thing: For the past few years, Tennessee hasn’t exactly been “behind” kids. Not in terms of delivering an annual test in an effective manner. When it comes to actually getting test administration and subsequent details right, Tennessee hasn’t exactly been “behind” the kids taking the tests. But this year, armed with a letter from the Governor and a new pencil, the kids are ready. 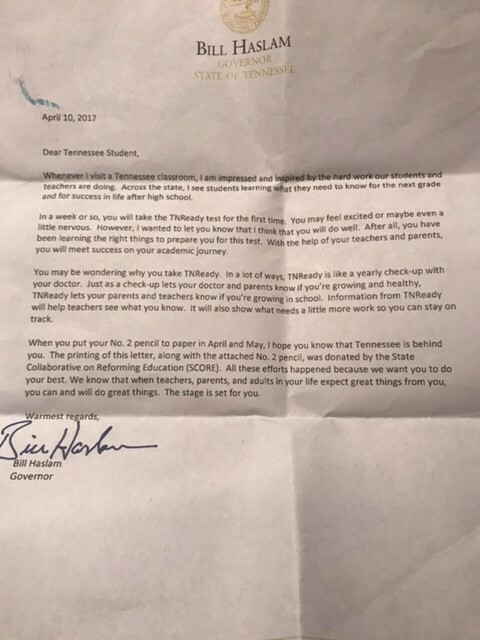 Haslam wants them to do their best, even though the state has been letting them down.